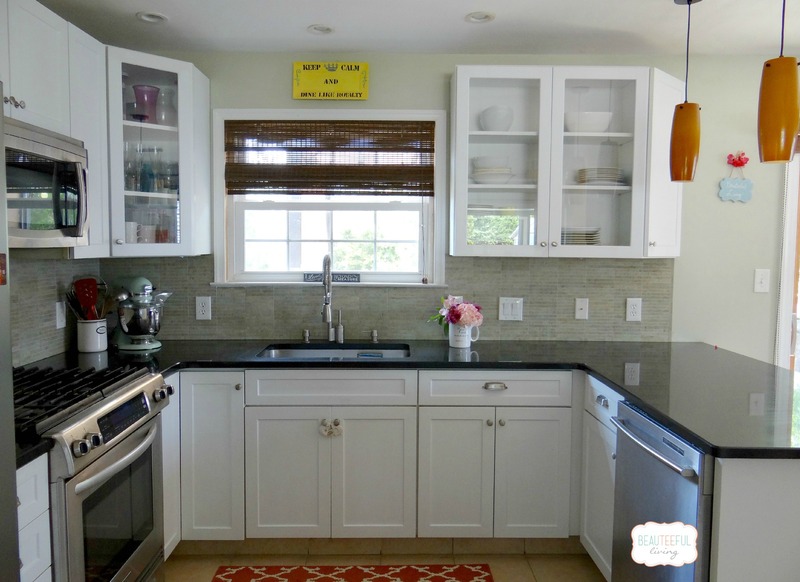 t's time for another tour from the Summer Home Tour Series! 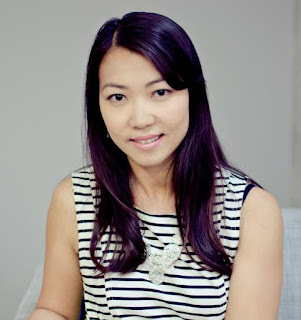 When I think of todays blogger, I think of fresh, emaculate, the perfect pops of color, and all things beautiful. Which is what makes her blog name perfect! 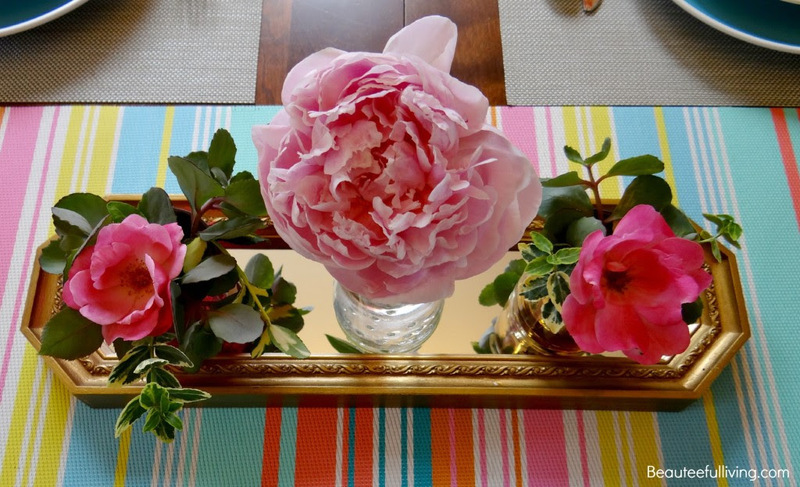 I’m delighted to be invited to join Michele’s Summer Home Tour Series. 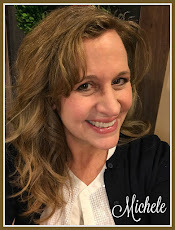 I had the best time at last year’s holiday home tour blog hop that Michele hosted. Not only is Michele talented, she is one of the nicest bloggers I have gotten to know. It’s a pleasure to share on Shelstring blog on how I decorated my home for summer! Our house is a split-level. 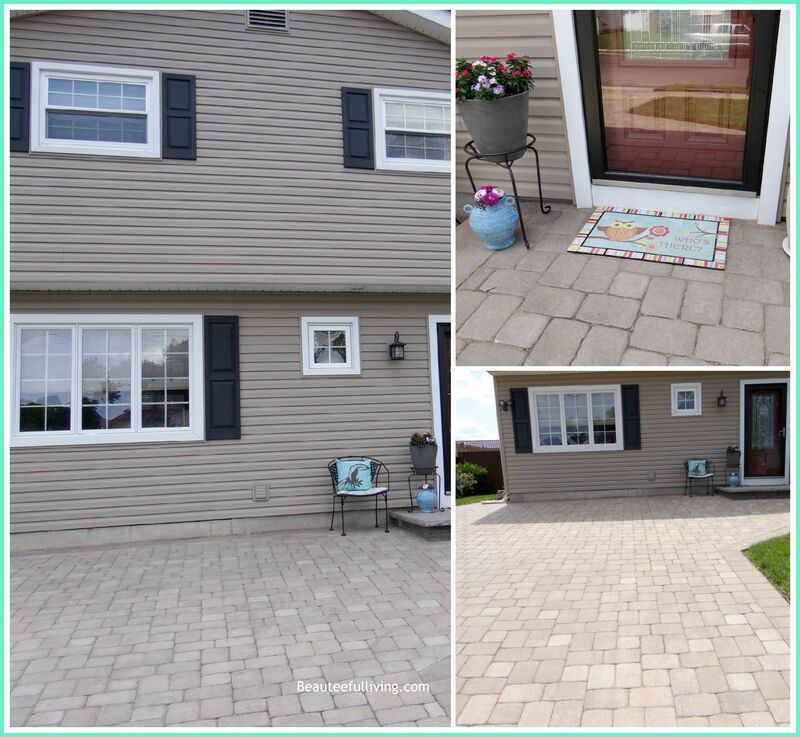 What you will notice most about our front yard are the pavers in our driveway, front steps, and pathway leading to our backyard. We did a complete makeover of our front and back yards 2 summers ago. Replacing the old concrete driveway and patio with pavers made a huge difference! 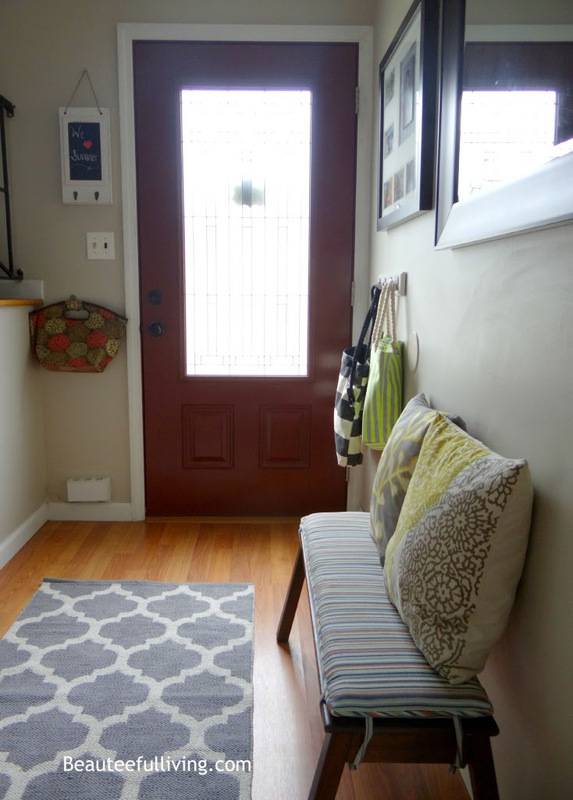 Since we have a small foyer, I try to keep the decorating at a minimum in this area. This bench seating set-up works for us for the summer. However, before fall starts, I’d like to replace this bench with a slender shoe cabinet. We keep our shoes off in our home. The only fireplace we have in our home is situated in our family room. Currently this room serves as a playroom for our 2 daughters. Once our youngest turns 8, we plan on converting this room back to a family room. We currently use our basement as our TV/media room. 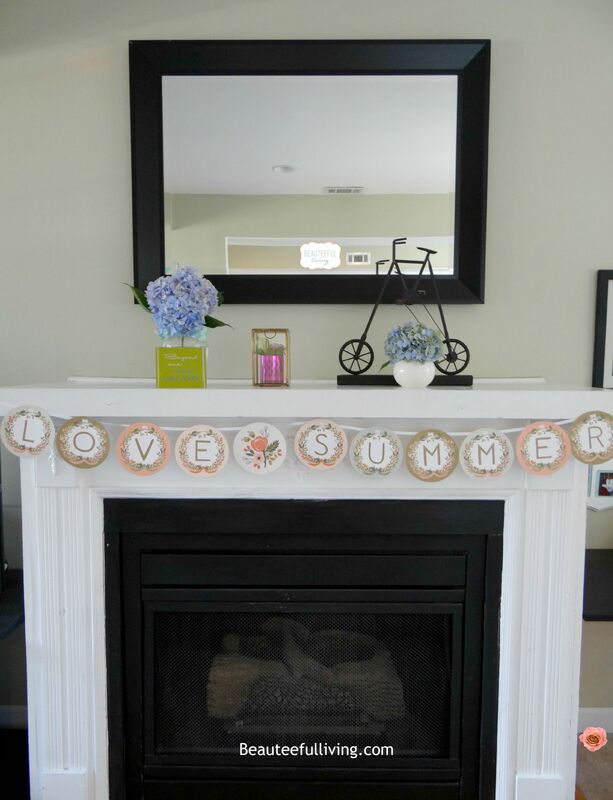 For summer, I decorated our fireplace mantel with hydrangeas from our garden and added a “Love Summer” banner. 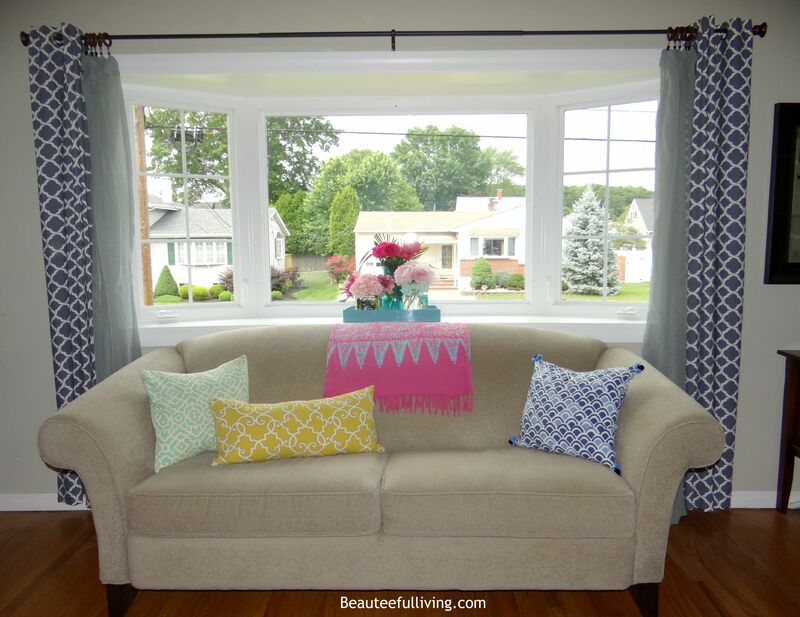 One of my favorite things about our living room is the large bay window in the center of the room. Not only does it let in lots of natural lighting, it’s also the favorite place where my 2 dogs love to hang as they stalk the mailman, UPS delivery person, and other dogs. We love the couch in this photo which we bought when we first moved into our home 10 years ago. Miraculously, with 2 dogs and 2 kids in our home, this sofa is still in great condition. I often change pillows and throws on this couch to go with the season’s color scheme. 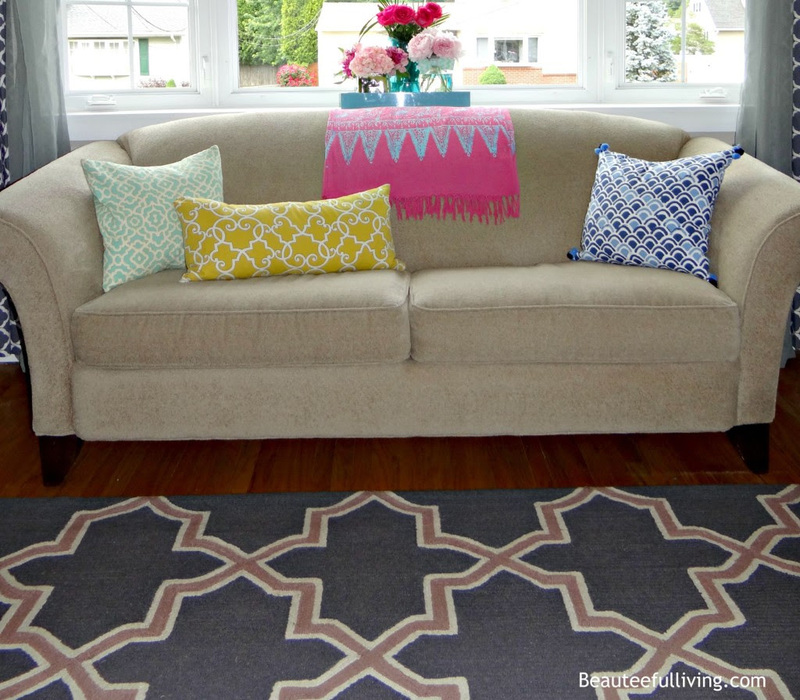 Another favorite item in our living room is this geometric rug. I get tired of things easily but 3 years in, I still love how this rug looks in our living room. Our kitchen was renovated 8 years ago. You can read all about it in this post. 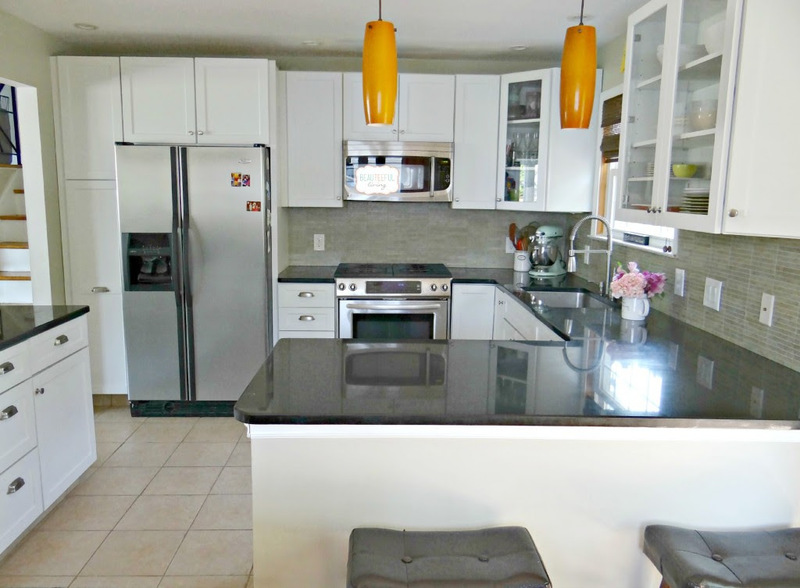 Opening up the walls in our kitchen was the best thing we did since it created an “open-concept” living space. 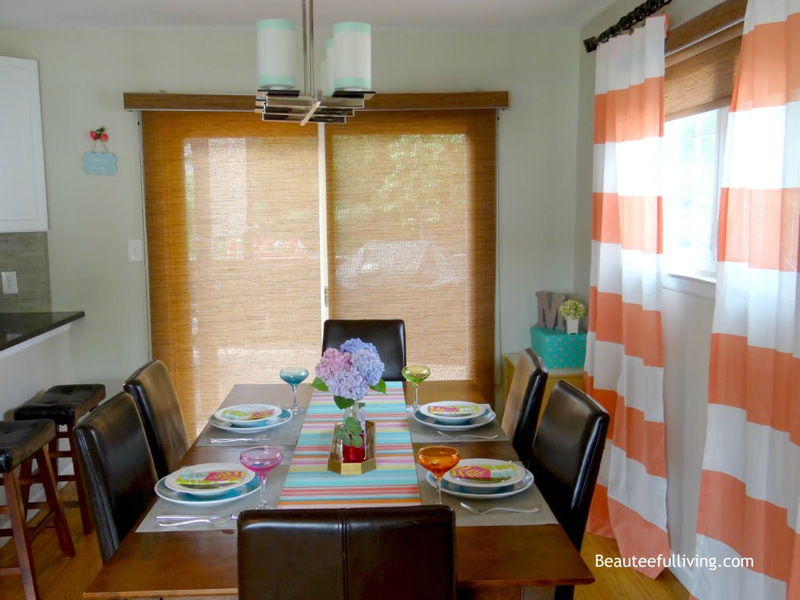 For summer, I decorated our dining room with coral and turquoise colors. You can read more about it here. 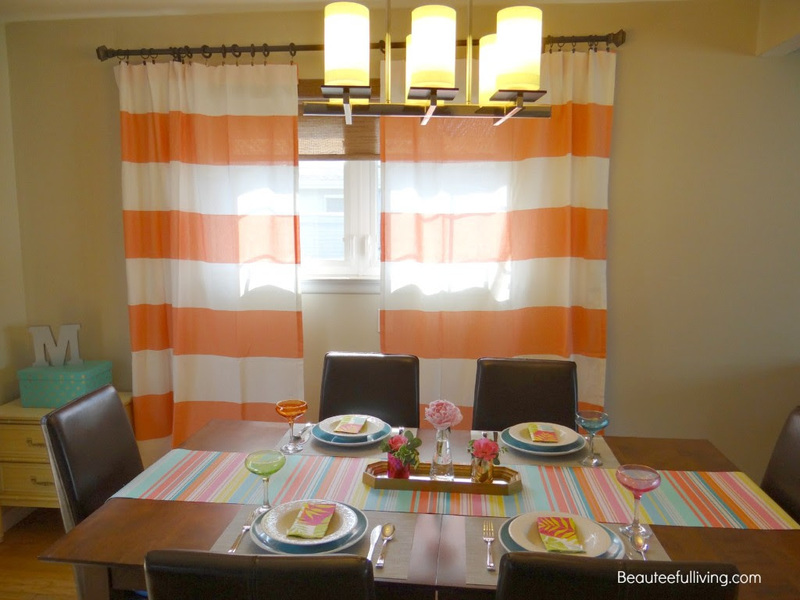 The coral and white striped curtains are my favorite home decor purchase this summer! As you may notice, I have a thing for the color coral. It’s one of my favorite colors. It just screams summer to me. And, boy, do I love summer! Bright and cheery colors like coral and teal make me happy. Let’s now head outside to our backyard. The sliding doors in our dining room lead to our wood deck. 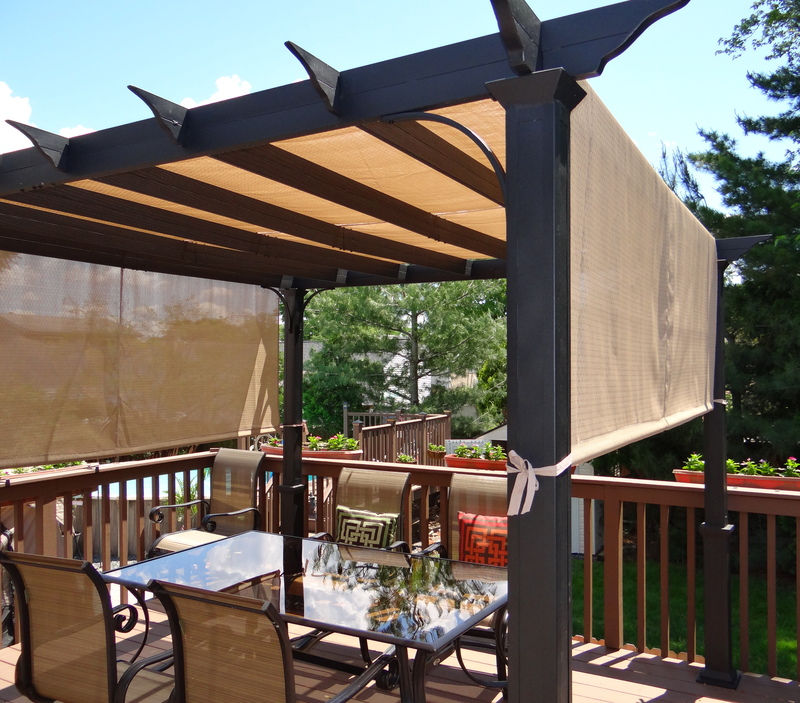 To maximize shade, last summer we installed a pergola over our outdoor dining set. Dining outdoors has been a much more pleasant experience during these hot summer days and evenings. 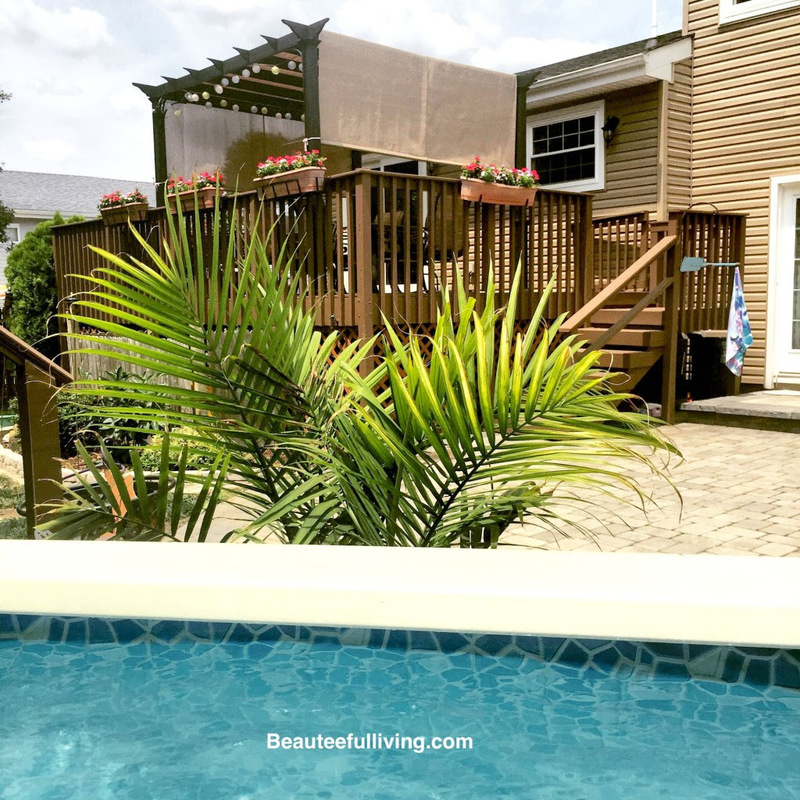 When we purchased our home, our above-ground pool area was one of the biggest eyesores. Read more about it here. 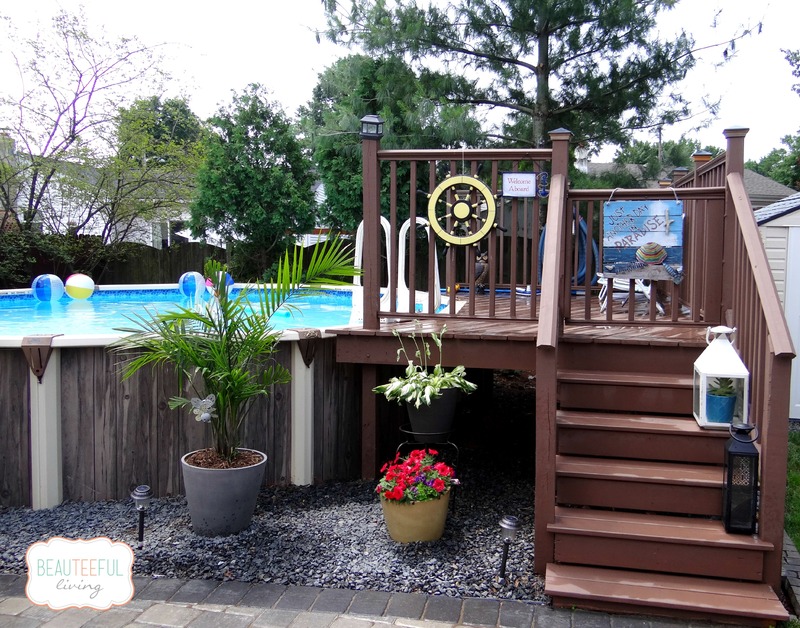 Ever since we installed a new pool deck and replaced the old concrete patio with pavers, this outdoor area has become a tranquil space for our family to relax during the summer. Since I love the tropics, I tried decorating our outdoor space with a tropical theme. Here’s a view of the back of our house from our pool. Love how our palm plants give a tropical feel to our backyard. They are seriously the next best thing to palm trees! My summer home tour concludes here. I hope you’ve enjoyed this little tour around the interior and exterior of my home. 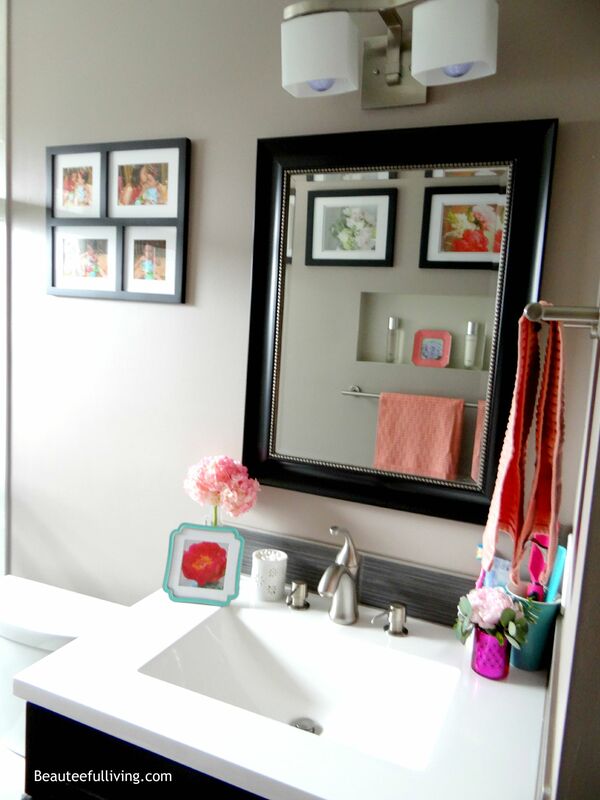 One of the most rewarding aspects of home ownership has been the freedom to make updates based on our own personal preference. 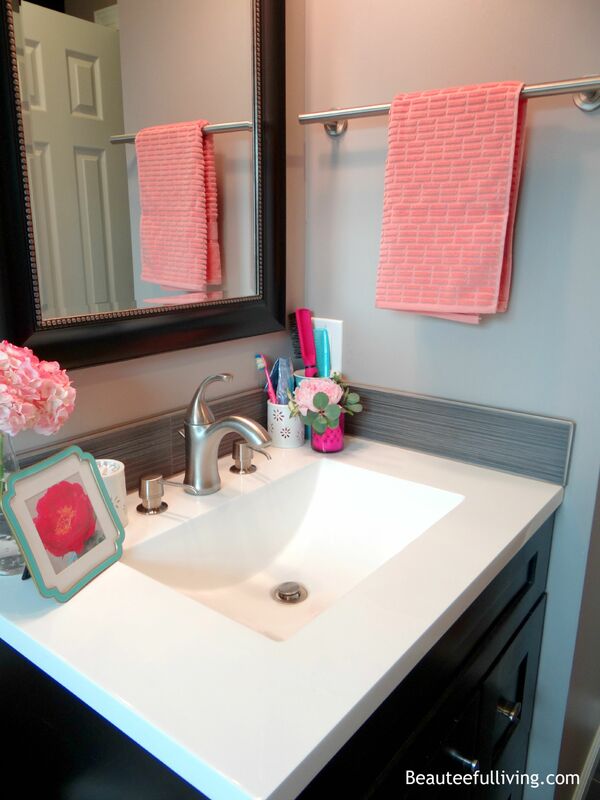 Coming up with a design plan for our home has been a fun and enjoyable experience. Thank you for visiting and big thanks to Michele for hosting this lovely Summer Tour Series! I can’t wait to check out the other tours remaining! See? Every bit as beautiful as her Holiday Home Tour. Thank you Tee! 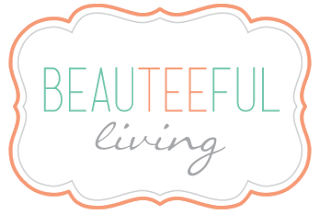 If you loved this tour, you will want to click on over to her beautiful blog. Her projects will inspire you to no end! Keep nice and cool, it's scorching hot out here in the Pacific Northwest. Thanks so much for hosting this tour, Michele!